There's a moment in Suspiria where we seem to return to the real world for a moment, yanked out of the menacing colored light of the ballet academy... this is our short journey with Daniel when he quits, and goes to a tavern for a short time, and then takes a late night walk through one of the city plazas. He enters a kind of space that's rare in Suspiria -- a space where a white key light gives definition to Daniel, and his dog, and the empty surroundings of the late night in an old world city. This is the only time in the movie where we attain some stability, and though it's a suspenseful, chilling kind of stability, it might still feel like a relief from those leering red and blue lights within the academy's close quarters. We're exposed in an empty, echoic darkness, cold and disengaged, waiting for death to come. Yet, it's a moment of respite. This scene contrasts so sharply with the rest of Suspiria that it's almost unbearable. We spend so much of the film in Dario Argento's nightmare geometries, bathed in red and blue light, that we may forget how colors fit together in the real world. Argento's world is a place where intense colors and mental states, discordant music and spatial continuity, all blend together into a fevered dreamscape of the broken mind. It's a strange, unpredictable, desperate piece of filmmaking, intent on frustrating our expectations at the turn of every scene. It seems that in Suspiria, Argento didn’t care about his audience. He didn’t care about narrative consistency or spatial logic, he didn’t care about twist endings or set-ups for sequels, and he didn’t care to offer us solace or consign us to despair. He didn’t care to wrap every narrative thread into a tidy knot at the end... like, what was the significance of Olga, or of Susie’s uncharacteristic kindness to Pavlo? Why were there maggots in the ceiling, except because of bad meat, or as a way to gross us out for a few minutes? If he's such an advanced filmmaker, why does he inflict bad timing and campy staging on us at every turn? We have to accept these things and absorb them as part of a film where Argento had other things to worry about... his style, his scope, his sense of time and space, and his devious rhythms, accompanied by Goblin's discordant prog. Argento's films are frequently described with the anachronistic term "grand guignol," which suggests macabre theatricality, the opera of the horrific. The ballet academy is a vast grand guignol set, the sort of place that you might expect to be built out of craft materials for a stage. It never really becomes a building for us, the audience... our understanding of its geometry is twisted and fragmented, revealed in shots of hallways and closed doors and empty rooms. Somewhere there's a great red hallway... somewhere there are a number of dance studios, a locker room, a pool. Some hallway houses a stairway to a dark attic where they store freshly-delivered meat. We have a general idea of the front door and the massive blue entrance-hall, but these are just for guests; everything else is jumbled together behind the walls, displaced and reconfigured, like Danielewski's House of Leaves. In the absence of orientation and space, easy access and unique landmarks, the ballet academy becomes a psychological space, a dreamscape designed by a nightmare architect. It loses its shape, and so, ultimately, the colors take over -- the reds and blues, our emotional signals, create a resonance for each room. The colors cling to the edges of the landscape, allowing the empty space to drop into pitch black. More than the white light of the courtyard, the red and blue light in the empty space seems to create a void. It's this blackness that threatens to engulf the girls, swallowing Sarah as she searches for the truth... and inviting Suzie to infiltrate it in search of the source of the school's troubles. Those reds and blues become some of Argento's most powerful tools. Over the course of the film, he turns the reds and blues into puppet strings for our emotional responses, and then he delights in pulling them, left and right, red and blue, forcing us to do a psychological dance. The reds trigger confusion and disorientation, the panic that Pat Hingle feels in the empty bedroom at her friend's apartment... or Sarah's desperation as she stumbles through the hallways of the ballet academy one lonely night. The red wine is the school's instrument to keep Suzie unconscious and bewildered, unable to come to her friend's aid. Red is generally accompanied by the throbbing drone of the Goblin soundtrack, a wave of aural pressure keeping us from concentrating or centering ourselves. The blues, by stark contrast, come to represent moments of unbearable stillness, the periods of lucid anticipation before an encounter in the dark. The bathroom in Pat's friend's house is lit in blue, as is the small, empty storage room where Sarah sinks into the foetal position, waiting for an unknown assailant to unbolt the door. It should be no surprise that the key to the school's conspiracy, a tiny decoration that prompts a moment of profound realization and apprehension, is a blue flower, stuck to a white office wall. So much of Suspiria is a war between cruel, stripped-down expectancy and stumbling confusion... sometimes two subsequent shots, both within the same sequence, are lit in entirely different colors. Often, the blue on one side blends with the red on the other to create a purple overlap in the middle. Some other colors take on symbolic overtones, as well, like green, which seems to be the color of remote rationality (worn as it is by the local psychologist), or of true darkness, when there's no red or blue to provide even the barest light. Yellows appear, as well, interspersed between the dominant colors, but these don't seem to have much significance... though they accompany some strikingly important events, like Sarah's final moments in a mesh of barbed wire behind the school's storage area. 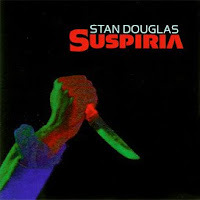 Reds and blues, the warmth of flesh and the chill of the empty shadows... these are the forces at work, the tectonic plates under the surface of Suspiria's strange narrative. This hematic inner light creates an alternate universe bathed in panic and dread. As the film progresses, these colors go from the sensory effects to hallucinogenic fetishes, the totems of particular states of mind, and they seep insidiously into the physical objects and musical accompaniment of the film. Thus, ballet academy becomes a psychic space, the grand guignol stage for a nightmare of sound and color, choreographed to perfection by Argento's hand. Ok, so...how do I get ahold of this movie? Your brilliant analysis (we're talking major lumens here) has stunned me. Sounds like my kind of film. Thank you so much for this beautiful analysis. You really put into words what I feel. You are brilliant !